One of the city's largest "luxury" apartment developments, this huge complex of 1,477 rental apartments was erected by Milford Management in 1987. 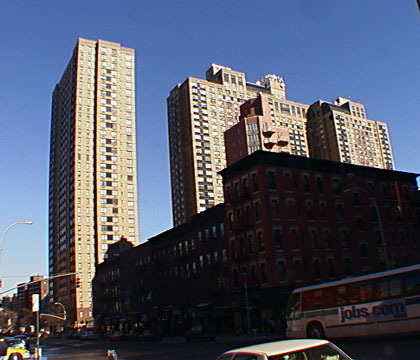 The bland 34-story towers occupy the full block bounded by Third and Second Avenues and 95th and 96th Streets. Most of the "slab" buildings are parallel to the cross-streets and form a rather imposing wall for the northern edge of the Upper East Side. Fortunately, that "wall" is not solid because of the separation of the towers. Furthermore, the facades of the beige-brick towers is modulated with brown brick that serves as vertical accents to further break up the mass of the project. There are, however, no balconies. A rooftop health club and pool atop one of the towers also adds some visual interest. Milford Management erected a smaller but similar full-block development, Windsor Court at 151-5 East 31st Street, in 1988. In addition to a health club and pool, this development also has a garage. a doorman, a driveway, a recreation room, a concierge, a bicycle room, and valet service and permits small dogs. There is a subway station nearby at Lexington Avenue and 96th Street on which there is also good crosstown bus service. A major entrance and exit to the FDR Drive is to the east as are several playgrounds. 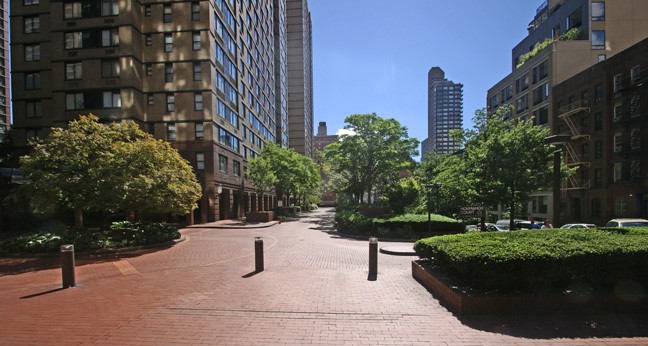 The very popular and desirable Carnegie Hill neighborhood is just to the west and south with many excellent schools and nice restaurants. There are many excellent views in this complex as low-rise structures are on the north and south.